Tempo is a recently opened Italian restaurant on Curzon Street, right near the now-defunct Mirabelle. There is a bar upstairs on the first floor, and the ground floor houses the dining room which is contemporary but not flashy. The colour scheme offers up warm, beige-y tones and large paintings splash the walls. This is a pretty and comfortable restaurant, even if the tables are squished together and the seats are small. I guess space is precious in Mayfair. I liked the menu. 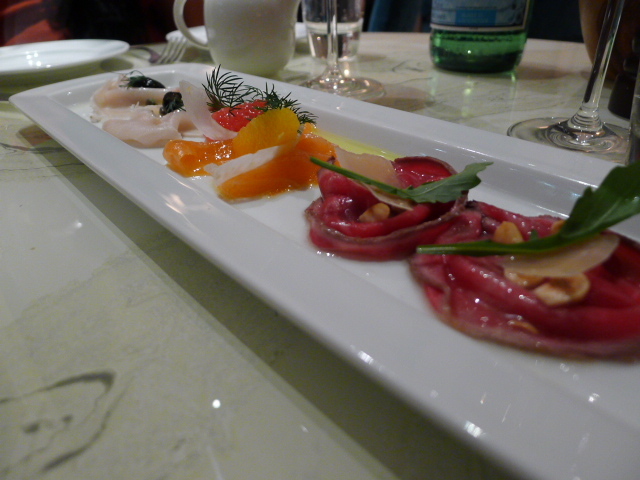 Subdivided between cicchetti (small eats), carpaccio, antipasta, pasta and risotto, fish and meats, side dishes and desserts over a compact two page format, it offered a reasonable range of choices without overwhelming the audience. It made me want to try a little bit of everything. I dined as a guest of the restaurant. 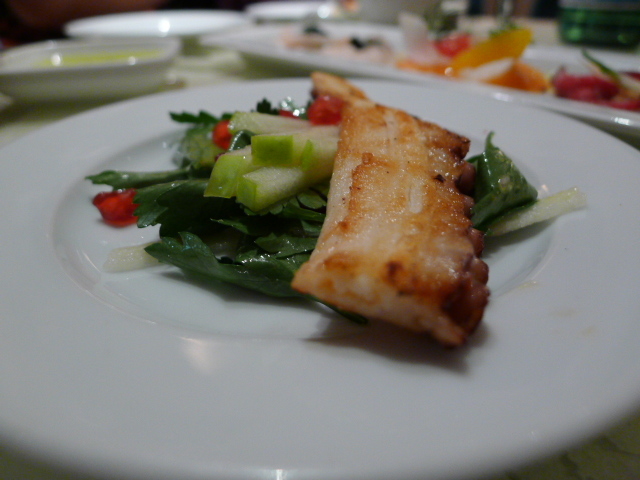 From the cicchetti section, an insalata di polpo, seared octopus, pomegranate with apple (£3.75) was lovely. The octopus was tender and and nicely seared, and there was a lovely freshness coming through from the pomegranate and julienned apples which well with the octopus. The bread selection included a fantastic carta di musica (flatbread) with a hint of rosemary which was crunchy and well seasoned. The focaccia was a bit dense and dry. It could have been better. There were three choices in the carpaccio section including swordfish with black olives, capers and lemon (£9.75); Scottish beef with hazelnuts and parmesan (£8.75); and organic salmon with grapefruit and fennel (£8.75). Although not listed on the menu, diners also have the option of ordering a tasting sample of all three for £10. The best of the lot was the Scottish beef, which with its rich flavour, worked nicely against the crunchiness of the hazelnuts and the bite from the cheese. The salmon and swordfish were very fresh, although there was too much grapefruit which drowned out the flavour of the salmon. 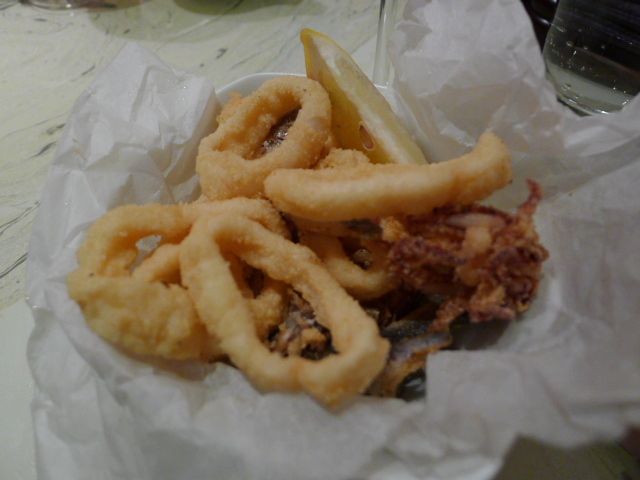 From the antipasti, we tried fritto di calamari & bianchetti, deep-fried squid and whitebait (£8). The thin coating of batter was to die for – light, airy, wonderfully crispy and expertly prepared. The whitebait was a touch over seasoned, but otherwise this was just about perfect. 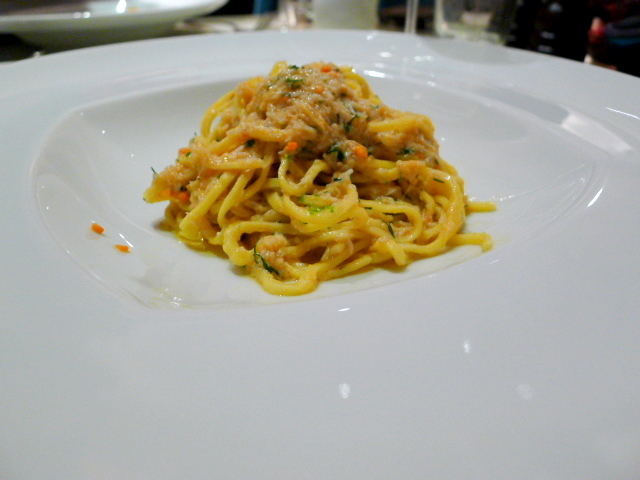 At our waiter’s suggestion we tried his two ‘best pasta’ dishes, the risotto with butternut squash and parmesan (£9.75), and the tagliolini with Cornish crab, dill, and lime (£10.75). The risotto was creamy and cooked al dente with a hint of crunch, but I personally found this dish a little too sweet for my palate. The tagliolini (homemade egg pasta) was excellent. You could taste the freshness of the eggs, but there was slightly too much chilli in the pasta which overpowered the crab and drowned out the taste of the dill. Nevertheless, this dish was rather enjoyable. 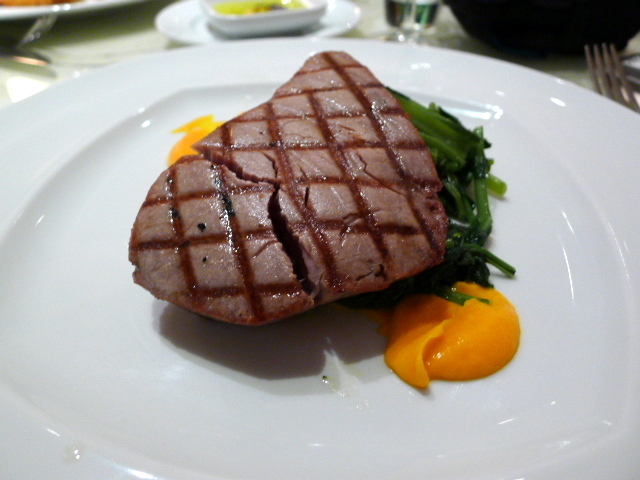 Tonno alla griglia, tuna loin with turnip tops and carrot puree (£18.75) was poorly prepared. Although I requested medium rare, the tuna came well done leaving it dry. The carrot puree tasted strangely acidic and unpleasant. It did not work with the tuna and a balsamic reduction might have been a more successful accompaniment. 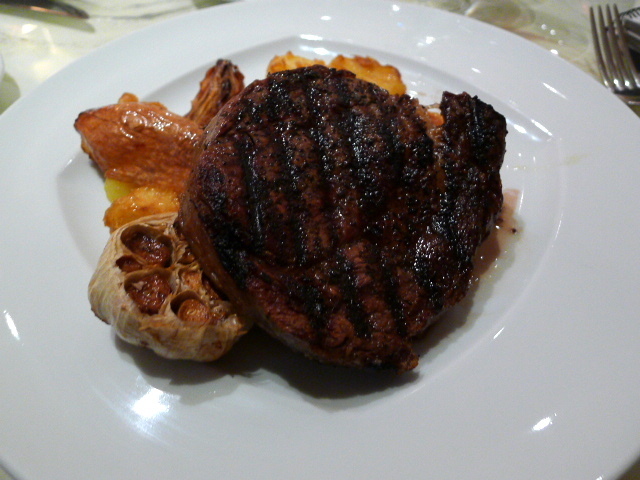 Costata di manzo, rib-eye of Scottish beef (£24.75), showcased a beautiful piece of flavoursome meat. The rosemary-roasted potatoes were reasonably crispy, although I couldn’t taste the rosemary. The roasted garlic was quite bitter and difficult to eat, despite being roasted till soft. It needed to have been blanched before cooking. Roasted onions had been sweetly caramelised. 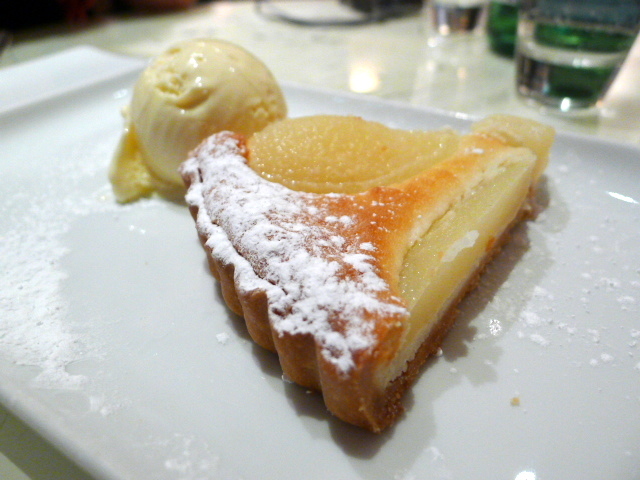 A pear and almond tart (£6.50) came with a luscious amaretto ice cream. The tart was tasty, although the pear was quite firm rather than soft, and the frangipane tasted a bit egg-y rather than almond-y. It was also served cold and I think room temperature would have worked better. The pastry was very good. The service was excellent, very natural and warm in an unassuming kind of way. On the whole, I thought this meal was excellent. And even though the tuna was disappointing, the fantastic deep-fried calamari more than made up for it. The prices aren’t bad, the food is good, the service is pleasant and the ambience is relaxed. This is an all round crowd pleaser and I can see it being swarmed by hedge fund types during the day and the average punter looking for a good feed at night. It wasn’t perfect in every aspect, but I don’t think anyone would walk away feeling disappointed. Price range: Three courses – £40 – £50. Excludes drinks and service. Just wanted to let you know, the review content seems to have been duplicated twice. Thatpasta looks delicious, but I couldn’t forgive a restaurant for over-cooking tuna. It makes you wonder who really enjoys it well done…! OH Yuk whitebait! Mum used to put them in our ommelettes and I didn’t know and I used to think as a kid, what are ALL these little white things looking at me for? Now I can’t bear to eat them. Hello stranger, happy new year to you! Last time I saw you was at the re-opening of that Morrocan restaurant in Soho! I went to Tempo with Carly of Greedy Diva recently, we both loved it, I am going to be writing my review soon. Hope all is well with you! I thought Tempo was pretty terrific and think I’ll be using the stylish Private Room next to that Boudoir Bar for sure. The food has a real edge and the service is very professional and friendly. Well priced too so I’ll be back..and back again for sure! By the way, I liked the tuna! Yes shame about the tuna. I think at most places its more of a miss than a hit. But everything else was great. The whitebait here was good. Promise. you would have enjoyed it. I’m glad you enjoyed Tempo. I did too!! Thanks for the compliment. I could have definitely had more of that amaretto ice cream.